Rest is a bench developed for the Metro40 outdoor furniture collection, that employs the mobius ribbon frame to great effect. One continuous, flowing form in aluminium or elegantly combined with jarrah wood slats creates a singular bench in backed and backless styles. It was designed in accordance with Landscape Forms’ environmental standards for ANSI/BIFMA certification. 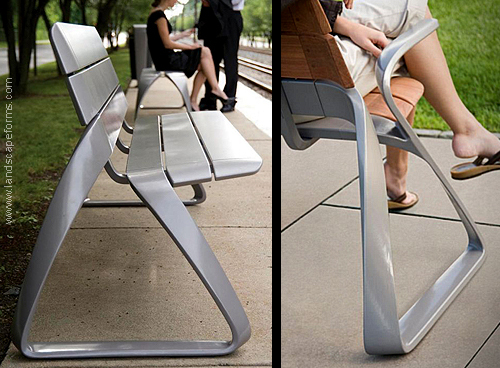 Optional arms are available on backed benches and intermediate seat dividers/ skateboard deterrents are available on both versions. Materials: jarrah wood, polyester powdercoated aluminium. Dimensions: 2030x 675x 845 mm.